Bucureşti (engl. Bucharest) is the capital city of Romania. 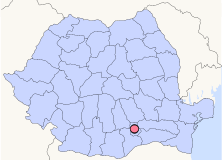 Unlike other Hattrick regions of Romania Bucureşti is not a county. In Hattrick, this region has the ID 788. Bucureşti is the biggest Romanian Hattrick region with 25.4% of the total number of Romanian Hattrick managers. One of the living legends of Romanian Hattrick, burebista, with his team Steaua Bucuresti (34378), plays in this region. Most of the teams from Divizia A are from this region.